Keep your family warm and prevent burst pipes. With the harsh winter weather, the consequences of losing your heat due a broken or malfunctioning furnace or boiler can range from a chilly inconvenience to a serious issue of pipes freezing and bursting causing major water damage. 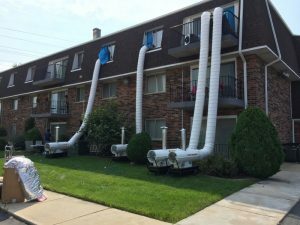 If your HVAC repairman is not immediately available, we can provide emergency heat pumped into your home from our heaters until your regular heat is restored. Our 210,000 BTU heaters can quickly restore the warmth to your home to provide a comfortable indoor temperature and prevent water pipes from freezing and bursting. Call our toll free number 24/7 to discuss your situation and arrange for our service. With the winter snows and the thawing and freezing comes ice damning. Our heaters can be used to clear your roof of the damaging ice and snow that lead to ice damming. Call us for a consultation on how we can help prevent ice damming on your roof. We can provide emergency heat pumped into your home from our heaters until your regular heat is restored.